3 Black Males Available.....Nice Pups!! 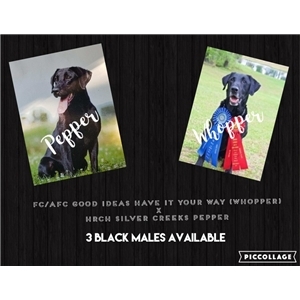 Pepper has her HRCH and is a full littermate to FC/AFC Johnny Dollar and FC/AFC Delponds Aunt Jemma. Johnny Dollar was a National Amateur Finalist last year and Jemma went out in the 6th series at last years National Amateur.